Hire reptiles, model photography, reptile photography, snake models. 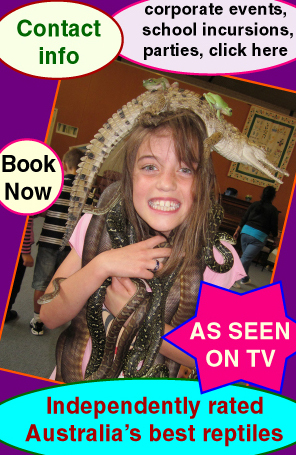 Reptiles for hire … TV, Corporate, photo-shoots, etc. BELOW: Snakebusters are the only people on earth with the world's five deadliest snakes - shown with total safety!Venomoid snakes - Taipan (1), Brown (2), Inland Taipan (3), Tiger (4), Death Adder (5) and others. This image copyrighted - do not reproduce. 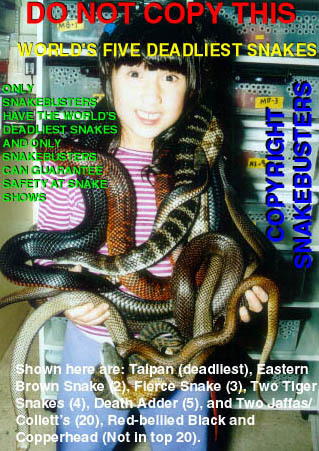 It is the only photo in the world of a person holding all five deadliest snakes at once! 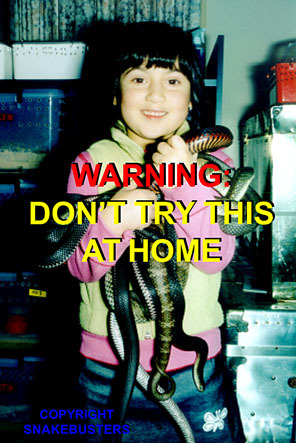 (Warning: Free-handling deadly snakes risks death - Don't try to copy what is shown below). BELOW: Baby with a cluster of five Venomoid snakes - Black, Tiger (3) and Copperhead. This image copyrighted - do not reproduce. (Warning: Free-handling deadly snakes risks death - Don't try to copy what is shown below). 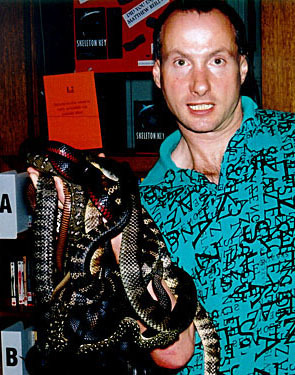 Below: Raymond Hoser with a cluster of venomoid snakes - Black (3), Tiger (4) and Copperhead (1) (and one harmless Diamond Python). This image copyrighted - do not reproduce. (Warning: Free-handling deadly snakes risks death - Don't try to copy what is shown below). The three snakes shown below are not venomous. They are effectively harmless to humans. Not only do we have the best available range of snakes, lizards, and other critters, healthiest and nicest looking specimens, best handlers and so on, but we are also the only ones who can provide deadly species in a safe way (as shown in the photos above). Normally a photo shoot with the likes of Tiger Snakes, Death Adders and so on is hazardous even for an experienced handler. 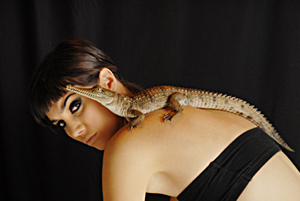 For someone with no experience with reptiles, it is downright foolhardy and dangerous. But using venomoid snakes (unique to snakebusters) these risks are eliminated. Snakebusters have the only venomoids in Australia (venomoid being having had their venom glands surgically removed). In recent times (2004) snakebusters wildlife have been used when filming 'The Hypnotist" on Channel Nine, Talk to the animals, on Channel Nine, Coxy's Big Break on Channel Seven, for a photoshoot for Sexpo 2004 and several animal and wildlife articles in newspapers owned by News Limited, Fairfax Publications, and others (Including The Age (Melbourne), Herald-Sun (Melbourne), Pakenham Gazette, Warragul Gazette, Peninsula Journal (Mornington), Knox Leader, Baw Baw Shire Times, Wimmera Mail Times, Cobram Courier, Ballarat Courier, Cranbourne Leader, Manningham Leader, Maroondah Leader, Whitehorse Leader, Knox Leader, etc). In times past, Raymond Hoser's reptiles have been used for Rock Band video clips, including the Goannas on Icehouse's Great Southern Land in 1981, Turtle Racing on the ABC's TV show Today Tonight in 1975 and countless TV, newspaper and magazine shoots since. Photos like those above (including the baby with five deadly snakes (all venomoid) draped over them) could only have been done in absolute safety using Snakebusters Snakes. 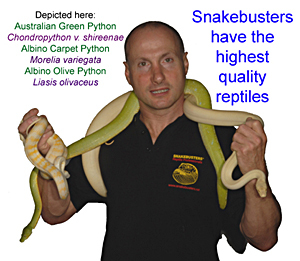 For further details in terms of satisfying your needs for reptiles in a photo shoot, TV production or whatever, it is best to contact Australia's Snake Man, Raymond Hoser on 03 9812 3322 or 0412 777 211 (within Australia). 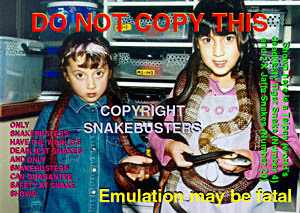 Snakebusters website gateway links to all other Snakebusters webpages, including entertainment, kids parties, childrens party entertainment, corporate events. Snakebusters incursion booking and contact page.